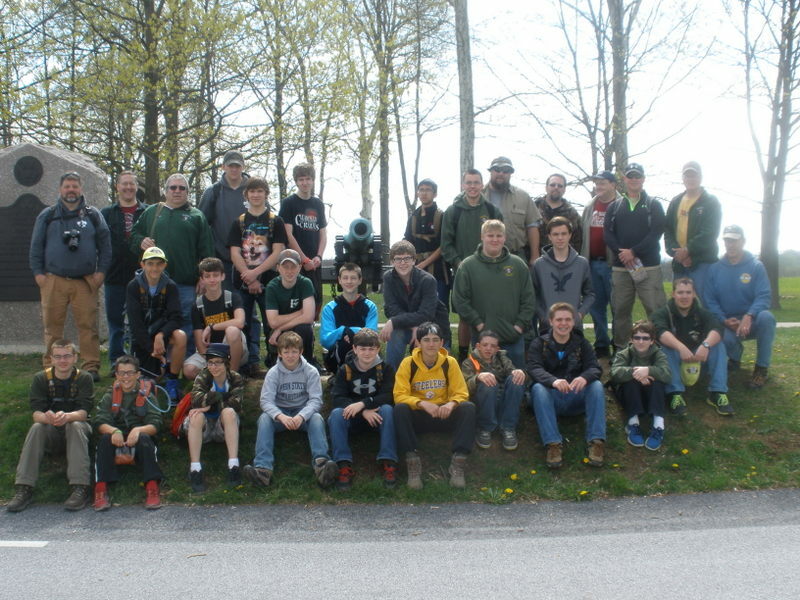 Boy Scout Troop 9 recently traveled to Gettysburg National Military Park to hike the historic trails of the battlefield. The troop also toured historic buildings in downtown Gettysburg. Starr, Dominic Kovach, Cole Smay, Max Forcey, Jeremiah Vezza, Levi Walk, Caleb Eisenhauer and David Lansberry. In row two from left: Kenny Starr, Logan Clancy, Porter Kling, John Swalligan, John McKenzie, Nathan Brubaker, Dawson Lynch, Ben Fye and Mike Clark. In row three from left: Ken Bell, Dan Bell, Ricky Lansberry, William Maines, Richie Shaffer, Jason Bell, Pratan Steiner, Dayton Kelly, John Swalligan, Eric Rowles, Pat Malloy, Jamie Lynch and John Mayersky.